Over the past year I’ve had a chance to get to know the ins and outs of the thrift industry more than I ever realized I would. Its really quite amazing what I’ve learned. Today I want to share with you what really happens to your clothes after you drop them off at a donation bin. Here are 5 things that I have learned that may surprise you! This shocked me, why is this happening? What I learned is a bit sad and speaks to how lazy we have become as a society. This is happening simply because it is easier to throw away our old clothes than it is to donate or recycle them. And I’ll be the first to admit I’ve thrown away old clothing. In one study we conducted we found 76% of people had actually thrown away bagged and ready donations after driving around with them in their trunk for months. As a result every year Americans throw away 25 billion pounds of clothing. Thats an average of 70 lbs per person! It can take up to 40 years for your clothes to decompose in a landfill. During this time its leaching chemicals and releasing methane into our atmosphere. Weather you spilt a drink on it or it got snagged on a chair, our first and usually only thought is throw it out. Clothing is extremely recyclable, 95% can be reused or recycled. Yes this means that pair of nasty stained kids underwear too! Donation centers will sort it out and while they can’t resale it they will send it to recyclers, keeping it out of the landfill. So next time you think “Nobody would buy this” think again, recyclers will, and will put it to good use. So YES you can donate underwear, and socks and clothes that are torn! 3. 85% of donated clothes don’t stay in the U.S.
And almost all of it is sold for a profit. But that’s OK, let me explain. Once you drop your clothes off they start a journey of thousands of miles and trade many hands. 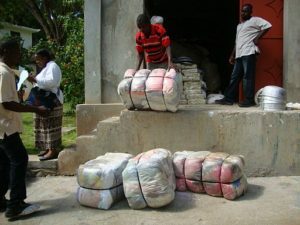 The donation center you donate your clothes to will bail half of it (50%) and export it to developing countries. The remaining half (50%) is put out on store shelves and around a third (15%) of that is sold locally. The remainder of unsold items (35%) are also bailed and exported to developing countries. So you dropped off those bags of old shirts and pants to your local thrift store and you’re feeling pretty good about it – and you should! Again remember, just by actually making it to the store and dropping it off you are now in the minority! So stop right here and give your self a pat on the back! Remember when I told you these stores export 85%? Well just like they sell it in their thrift store they also SELL it to developing countries. This is their business model, get people to donate stuff to them, sell it, make a profit and fund their cause. Sounds good doesn’t it? Thats because IT IS! Their mission is not to give clothes away for free, but to do good, and last I checked its a lot easier to do good when you have money. Dumping a large quantity of any commodity into a free market system will destroy it. Most developing countries know this and will not accept free clothing (except in times of emergency and natural disasters). When bought and sold it helps local distributors and vendors generate an income and stimulates the local economies. It also provides people a dignified way to earn a living and provide. Giveit is the best way to donate your clothes by making the process take 10 seconds and extremely convenient see how we do it. Giveit partners with local charities who benefit from the donations. We accept all clothing, shoes, personal accessories as well as small household goods. If it fits in a trash bag we will take it.